Devlog #6: Prototype 3.1 is out! It’s only been 1 week since the release of 3.0, but we’ve got another update for you: 3.1. Download it now on http://powerlevelstudios.com. Starting the game from outside the vault was always a terrible experience. Like most games, we added a title screen. The background is a video of the game playing. We’re experimenting with the idea. Currently, it’s only a placeholder video. 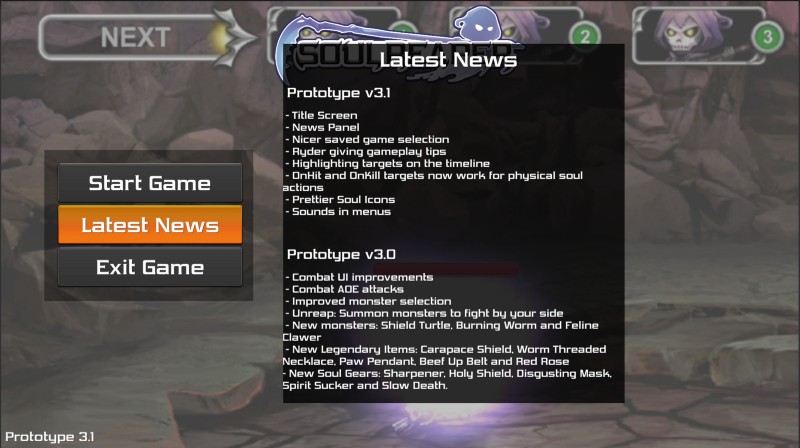 As you can see from the screenshot below, we also added a Latest News section. That way you’re always up to date with the latest development. We’ll add an Options menu there in the future. 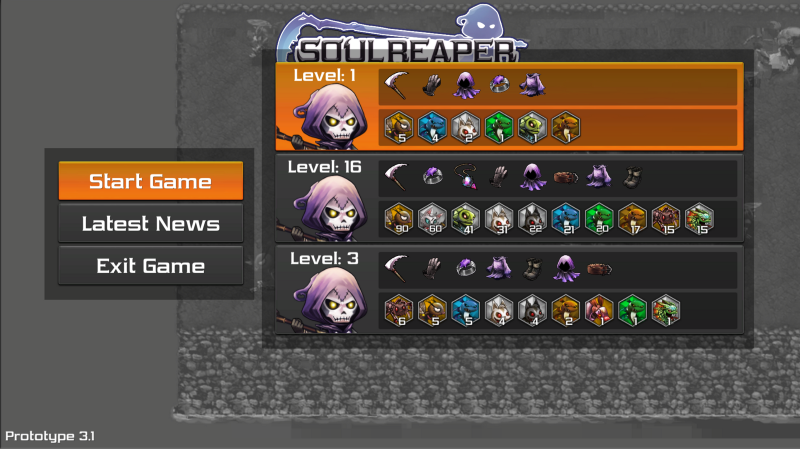 We’re showing the player’s level, their equipped loot and the top 10 souls they own. The equipped loot will obviously look better once we have actual icons for each loot. By moving the cursor to select a monster, you can see where they sit in the timeline, making planning your attacks much easier (see how the Bubbly Fish’s timeline icon is coloured green?). We finally put sounds in all the menus. The game feels a lot more polished simply by adding those. The sounds are not final yet though. Are you looking forward to the new changes? Do you prefer weekly little updates like this one or big monthly updates like the previous 2 months? What improvement would you like to see in a small weekly update like that? If you haven’t tried the prototype 3.0 yet, make sure to download it here: http://powerlevelstudios.com. The changes in 3.0 make it really interesting to experiment with different Legendary Loot and Soul Gear to become quite powerful. Below are builds we think are valuable to graduate from wannabe reaper of soul to a real Soul Reaper! 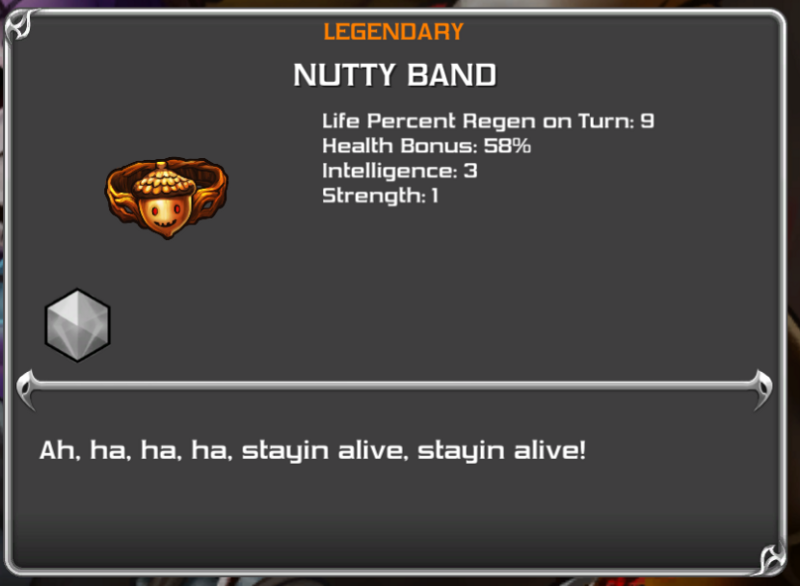 This build boasts incredible health bonuses due to the synergy between the Undead King Crown (Windy Fish) and the Nutty Band. Stay healed thanks to all the Life Percent On Turn bonuses. Plus, the Paw Pendant and the Sharpener Soul Gear synergizes really well due to increase Life On Kill, which now also gets applied on Hit. The Carapace Shield’s bonus is really incredible. Slot any soul gem that does buffing or healing and it will target all your allies. The increase in Intelligence from the Undead King Crown with Bubbly Fish makes it so you can cast more often! Carapace Shield (Saint Squirrel or Shield Turtle or Burning Worm): Heal all party members. Undead King Crown (Bubbly Fish): Doubles Intelligence received from the Bubbly Fish soul gem. Similar to the Party Player build: deal damage to ALL targets. Take advantage of this by slotting your most effective single target soul! Carapace Shield (any single target Soul Action): Deal damage to all targets. You basically get two meat shields and damagers for the price of one. Take advantage of enemy weakness that way. Beware of spirit expenditures though! Using the Red Rose, you can now cast Soul Actions for free while having a meat shield. 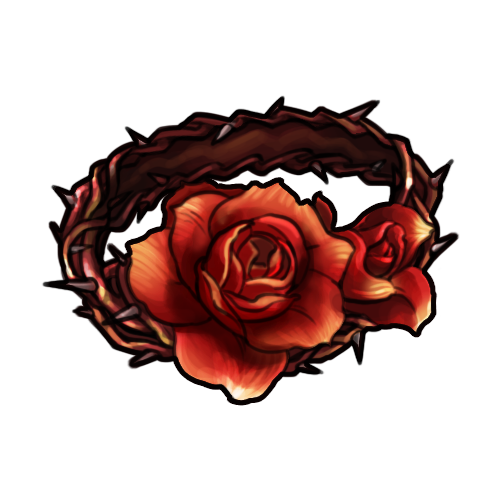 Red Rose: Slotted Souls have their spirit cost reduced to 0 when unreaped. 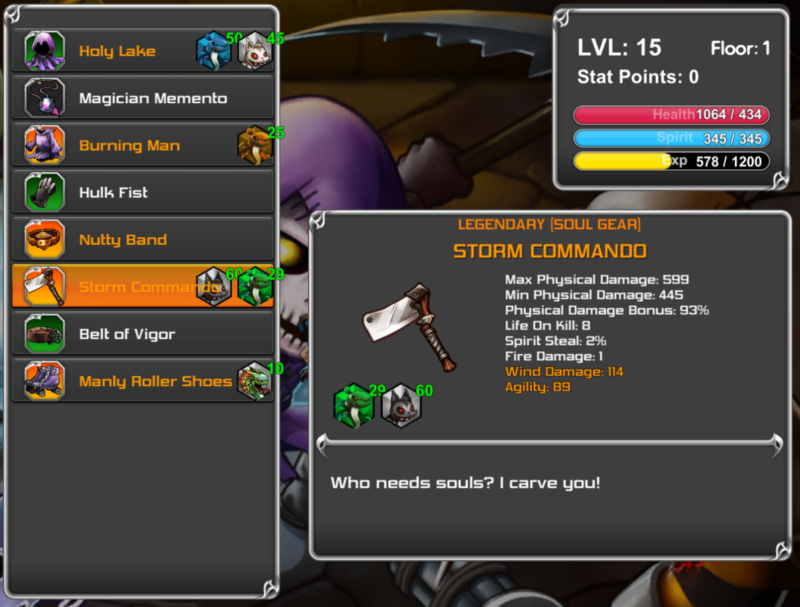 There’s no better way to level up a soul of your choice, all the while beefing up the Soul Reaper thanks to increased exp. For extra efficiency, combine with the Better Together build and fight the largest possible groups of monsters. 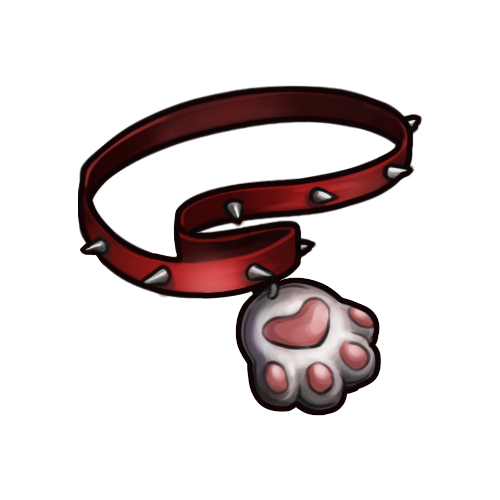 Beef Up Belt: Gain way more exp and reap two souls of the same type as the slotted soul for the price of one! The main idea here to have a 2 slot head piece. Red Rose usually comes with 2. With the Disgusting Mask, an attacker receives a large percentage of the damage back to them. Plus they get a burn effect that damages them every turn. Amplify the burn effect using Drakey Toothey with Scorch Blade Soul Gear, the Ring of Fire, Burning Man and Hot Wrap. 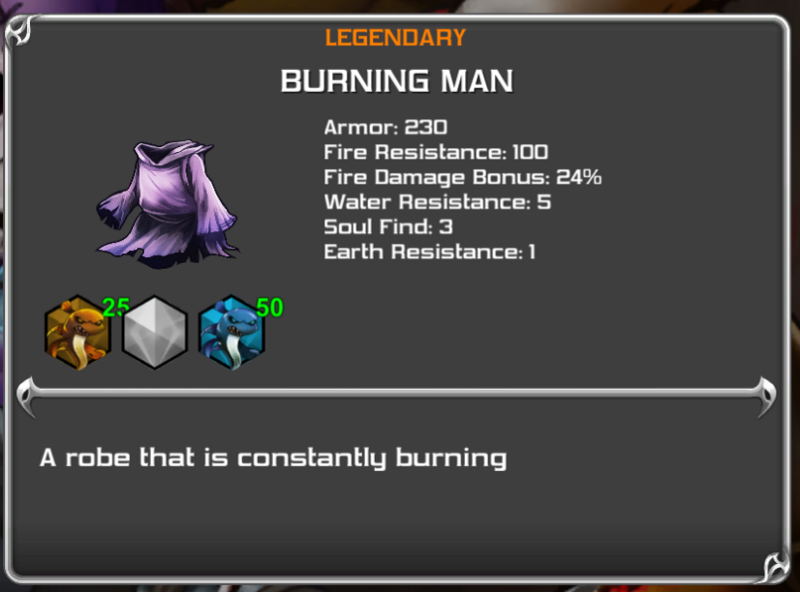 It’s a good idea to not equip that in areas with monsters with high resistance or absorption of fire damage. Apply a slow effect to all targets thanks to the Carapace Shield’s unique attribute. 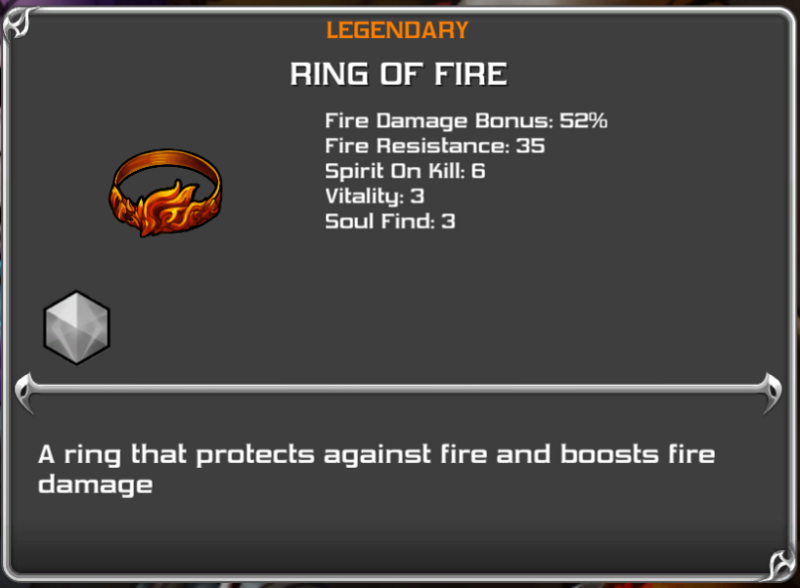 Power up the fire damage more with all the legendary fire-based loot. Have you tried any of these builds? Which one worked best for you? Have you found any other great build? 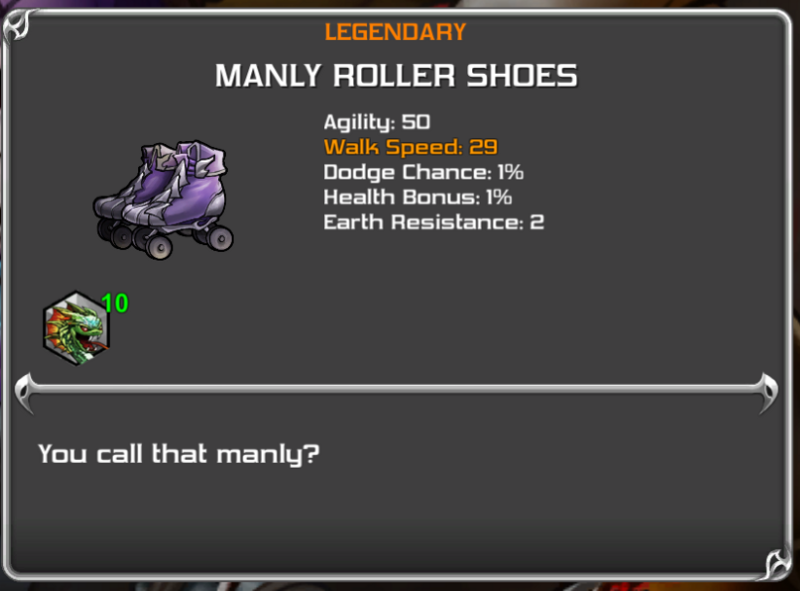 If you haven’t tried the prototype 2.0 yet, make sure to download it here: http://powerlevelstudios.com. 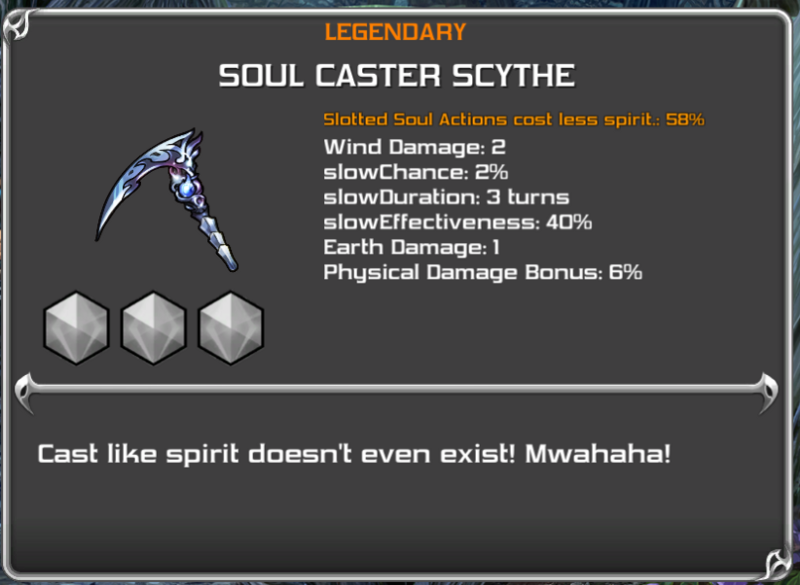 The changes in 2.0 make it really interesting to experiment with different Legendary Loot and Soul Gear to become quite powerful. Below are builds we think are valuable to graduate from wannabe reaper of soul to a real Soul Reaper! 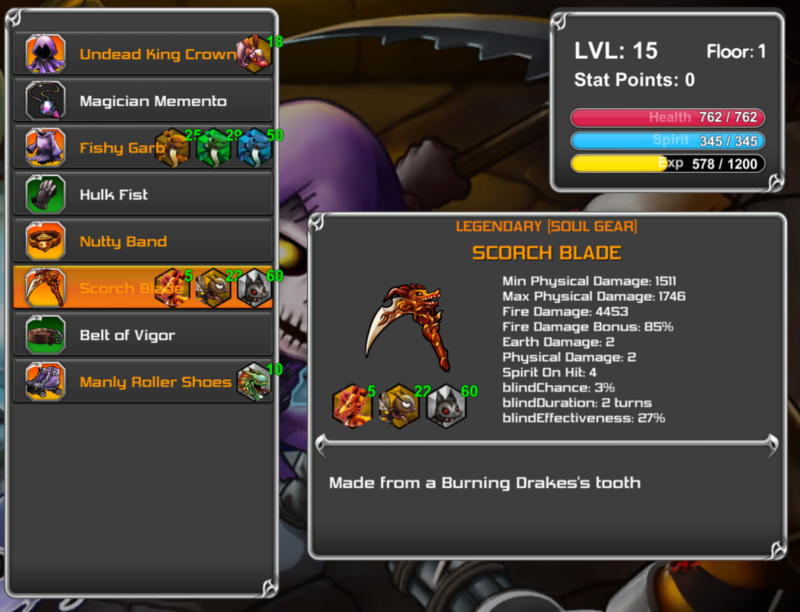 Combine the Scorch Blade Soul Gear (Burning Drake + Flame Bee + Stabby Squirrel) with the Legendary Drakey Toothey Scythe for ultimate fire damage! Looking at those resistances and fire damage!